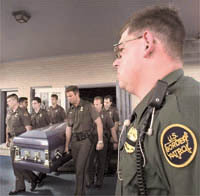 GOING HOME: Border Patrol agents carry the body of their fallen comrade Ricardo Salinas to the waiting hearse for the journey to his hometown for burial. Death also claimed two U.S. Border Patrol agents, Susan Lynn Rodriguez and Ricardo Guillermo Salinas, who were killed in the line of duty. They were killed by Ernest Moore, son of a Harlingen policemen, who had already killed two Rio Hondo women and wounded a deputy sheriff July 7, 1998. The shooter, Ernest Moore, was shot and killed. A second-generation Border Patrol agent and a rookie who had been on the job for less than a year were killed Tuesday in an ambush. Susan Lynn Rodriguez, 28, a five-year veteran, was the first female officer slain in agency history. Her partner, Ricardo Guillermo Salinas, 24, had just finished the Patrol Academy in January. Authorities said they were killed when a gunman leaped from a cornfield and began shooting as they walked toward their car. A Cameron County sheriff's deputy was wounded in the same incident. The suspect, Ernest Moore, 24, was wounded in an ensuing shoot-out with other officers arriving on the scene. He died Tuesday night at the hospital. San Benito police officer Albert Aguirre said the incident began when Moore showed up at a house where his unidentified former girlfriend was staying in Rio Hondo. The owner of the house, Margarita Flores, 53, and her daughter, Dalia Morin, 31, were shot to death. Dan Morin, 22, Flores' son, was critically wounded. The shooting led to a countywide manhunt, and the sheriff's department asked for help finding a white pickup truck that fled the scene. Rodriguez, Salinas and Deputy Raul Rodriguez went to a house south of San Benito where Moore's father lived. The three had just finished talking with the father and were returning to their vehicles when they were shot. Although the Border Patrol normally searches for drug traffickers and smugglers, the agents often assist local law enforcement in the remote areas where the agents operate. Immigration and Naturalization Service spokesman Russ Bergeron said the agents killed Tuesday "never had a chance."